In the aftermath of the release by CBS and Paramount of production guidelines on June 23, 2016, stunned fan producers assessed the impact of the new restrictions on their shows. Although many fan projects suspended production immediately, a June 28 podcast interview with CBS’ vice president of product development, John Van Citters, reassured some fan productions that they could resume work, while others considered how to retool to fit the guidelines. Others — including the largest and best-known, Star Trek: New Voyages — remained ominously shuttered, awaiting further clarifications that may not come for some time. The titles below link to each production’s statement in response to the studios’ new guidelines. Productions that have not released a statement are not listed. An asterisk (*) denotes that a production is suspended, cancelled, or still considering whether they may continue. Chance Encounter Continuing; “aware” of guidelines and appears compliant. New Voyages/Phase II* “New Voyages no longer exists.” 5) Fate of episodes currently in post-production unclear. “Long-form radio dramas” aka “audio dramas” are expressly not covered by the guidelines, according to the Engage podcast’s interview with John Van Citters. All audio dramas that initially closed down have since reopened. Special thanks to James Heaney for collating these responses. This list will continue to be updated. Many ongoing fan projects have not yet made any statement. If you have information about a production that is not given here, please use the Axamonitor feedback form to submit additional information. 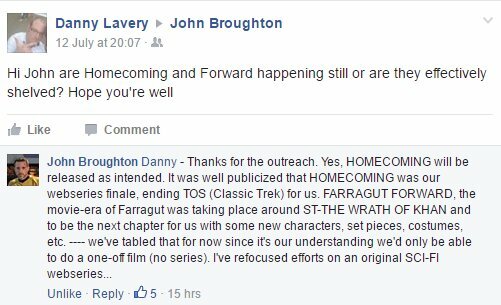 New Voyages was actually canceled in late April (before guidelines were made public). The sets have since been licensed as an official Star Trek tour site. 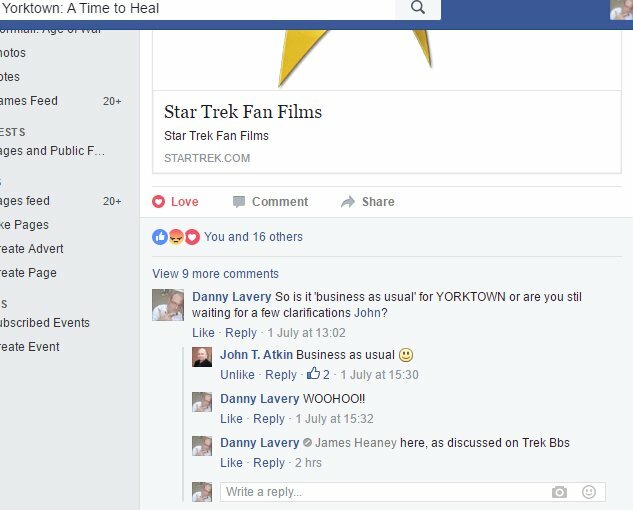 The John Van Citters interview appeared to specifically address and authorize Yorktown (he made reference to a movie that has been twenty years in the making, and that can only describe Yorktown).